Though still early summer, I got some green, unripe mangoes because of the dust-storm and rain. 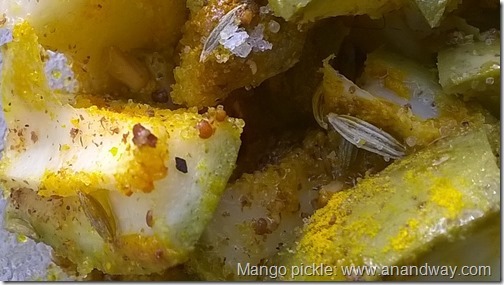 Some unripe mangoes fallen by the storm are now in my Punjabi mango pickle, cooking in the sun with the drumstick pickle! It is Ayurvedic, Vegan, no-flame cooking, and safe as a kids’ cooking project. Deseeded, green, unripe mango: 2 large, washed, dried and cut into one inch pieces. Mix all ingredients and put in a glass bottle with a tight lid. Let sit in the sun for 7 days. Shake the bottle once a day to mix the juices well and let the sunlight work on it.